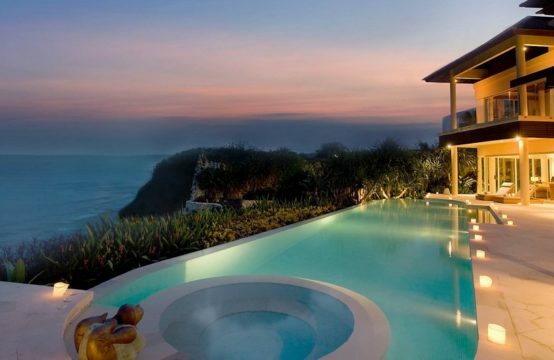 Within the beautifully designed villa – which skilfully combines contemporary architecture with natural materials from the Indonesian archipelago – are both formal air-conditioned and casual alfresco living and dining spaces, generously sized air-conditioned bedrooms and bathrooms, a large infinity pool hugging the cliff edge, and a well-equipped gym and massage area, with sauna and steam room. After a hearty breakfast served on the dining terrace, spend your morning pushing weights in the gym, working up a sweat in the sauna and cooling off with a few laps in the pool. After a morning of activity, you’ll deserve a leisurely lunch in the poolside pavilion, and a siesta on the deck followed by a massage. Take your chauffeured car to Pandawa Beach for an afternoon swim or kayak, then sink into a deep relaxing bath with breathtaking ocean views, before adjourning to the pool pavilion for sunset cocktails and a seafood barbecue prepared by the highly accomplished chef – part of a ten-strong staff dedicated to making your time at Villa Soham really special. Maybe watch a movie in the media room, then retire to your air-conditioned bedroom for a blissful night’s sleep. 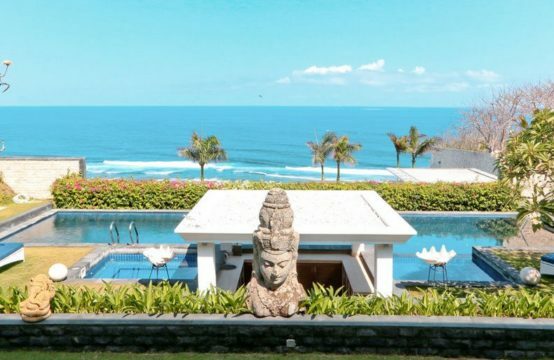 While Villa Soham can host up to 12 guests, it is perfect for multiple families or groups of friends – as many as 22 – when combined with Villa Hamsa. Conveniently for singles and those travelling with kids, three of the villa’s bedrooms can be set up as twins. Custom-designed furniture, a soothing grey and ivory colour scheme, 42-inch cable TV and DVD players, extensive wardrobe space and a choice of air-conditioning or overhead fan are features of all five unusually spacious bedrooms. The bathrooms continue the contemporary theme with walls of Javanese marble and smoked glass, and cream acid-washed marble floors; all feature rain showers and there are bathtubs in three of them. Bask in the stunning views across the pool towards the ocean from the 2.4 metre wide Emperor bed resting in the centre of this huge master suite. The view is equally impressive from the bathtub set before a wall of glass in the adjoining ensuite. Both bedroom and ensuite open onto a lotus-lined teakwood deck with private seating. One of the two guest bedrooms that flank the master suite is equally spacious, with the same stunning ocean view across the pool from both bedroom and bathroom, a centrally positioned bed comprising two twins (that convert to a king), and with a small terrace beyond the wall of glass. The slightly smaller second guest room has a king-size bed and faces the garden beyond a circular staircase leading to the living pavilion veranda. Two further guest suites occupy a third-level wing, both with vaulted roof, twins converting to a king-size bed, daybed and ottoman, and walk-through wardrobe into the shower room. The ocean views from the south-facing guestroom are wonderful. Behind a stunning feature wall of Bengkirai-wood pivot doors lies the air-conditioned media room, where comfortable seating is sandwiched between the ocean view and small courtyard garden, and set before a 48-inch TV. Tucked below the pool is a large well-equipped gym with separate rooms for sauna and steam, and a massage room. If required, the gym can be converted into a spacious ocean-view conference room. Capacity for 10 guests in 5 bedrooms (all with king-size beds, three of which convert to twins). Two additional guests accommodated on extra beds (charges apply). Living and dining room; media room; alfresco dining terrace; open-sided pool pavilion; well equipped kitchen; gym and massage room with steam room and sauna. 22m swimming pool and sun terrace. 48-inch flat-screen TV with cable channels and DVD player in media room; 42-inch TV and DVD player in the bedrooms; Sonos sound system; DVD library. Villa Soham is well equipped for families with young children. Facilities include high chair; cot; pool toys; Playstation. Other equipment can be hired on request (extra charges apply). Gym with treadmill, cycle, cross-trainer, weights bench; in villa treatments selected from a comprehensive spa menu carried out by professional beauty therapists in the massage room (extra cost applies); sauna and steam room; private gym garden.